When you watch Army and Navy play, you know there’s going to be option football — and tons of it. Not the diluted “read offense” the Denver Broncos are now running that the commentariat insist on calling an “option offense,” or even the far more coherent (but still different) spread-and-read-to-run offenses of teams like Oregon. No, Army and Navy — along with Air Force and Georgia Tech — run the real deal. Specifically, those teams use the “flexbone” offense, which actually grew out of the pass-first run and shoot, but evolved into the premiere run-first offense in the country. Indeed, those four teams — the three service academies and Georgia Tech, which is led by former Navy coach Paul Johnson — were the top four rushing teams in college football. It must be noted: It was a disappointing year for both Navy and Army, and neither team will be going to a bowl game. But when Army faces Navy, that doesn’t much matter. This weekend, the underdog Black Knights had a great plan and outgained the Midshipmen, but ultimately it was coach Ken Niumatalolo’s Navy squad that took the day, winning 27-21 on Saturday. The game was a great example of how the flexbone has evolved in recent years. Navy and Air Force in particular have taken the base “flexbone” set, which has a back lined up behind the quarterback — the “B” back — and to each side a split wide receiver and a wing player, each an “A” back. Most plays start with one of the A backs going in motion and the triple-option sequence begins: The quarterback can hand it off on a dive up the middle, take it around end himself, or begin to take it and pitch it to one of the A backs. The beauty of the option is not just the reads, but the advantage reading players gives the offense. By reading certain defenders instead of blocking them, the offensive line and any other blocker can double-team and generally wreak havoc on the rest of the defense, thus creating lots of space and running room. Niumatalolo and others at the academies, however, have evolved the offense by not just lining up in the same flexbone set and running the veer triple and the midline option 40 times a game. (Although they’re happy to do that, too, if you don’t defend it well.) Instead, they will also mix in formation variations, motion, shifts, and so on to get the matchup that they want. In other words, the service academies are running a pro-style, multiple-formation, heavily game-planned, option offense. Sounds like heresy, but look at Navy’s touchdown in the second quarter on Saturday. Around the 10-yard line, Navy lined up in a spread set with one back. The near receiver to the right was aligned in a common “pro-style” adjustment, a “snug” set to the formation. If he had put his hand down like a tight end, however, Army’s defensive line might have spread out wide to cover him. But Navy wanted to run the speed option outside. Navy’s coaches sent slotback Gee Gee Greene in motion to the other side in essentially a bunch set to the left. This drew Army’s Steven Erzinger to the other side, potentially to defend a pass or overload run to the left. Instead, Navy came back to the right with quarterback Kriss Proctor and B-back Alexander Teich on the speed option. After the snap, you can see the play develop and it is obvious Navy’s blockers have a leverage advantage on Army’s defenders. (Running the play to the short side of the field, i.e., the boundary, is another thing flexbone teams don’t mind doing, and often achieve a numbers advantage by doing so.) Navy’s line fires out and is able to cut off the inside penetration from Army’s linebackers. 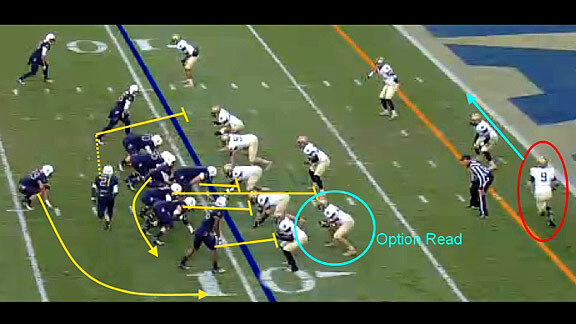 Remember, even though this play was not a triple option or an inside play, Navy runs inside so often and its runs hit so quickly, the threat of a big run straight up the gut is always a concern, which in turn helps option teams like Navy get outside. Not only have Navy’s blockers engaged Army defenders, you can see in the above image just how many of them are flat out on the ground. (Complaints about cut-blocks, or low blocks that get defenders on the ground, always follow option teams, but on this play, there weren’t really any cut blocks.) Receiver Brandon Turner has reached his defender and has sealed him inside, the entire purpose of his “snug” alignment. Proctor has already pitched the ball — probably a bit early — but since the play is to the boundary it is more important that the pitch was clean and that Teich is given the opportunity to make it to the edge and get six points, and …. … one outstanding effort later, he gets into the end zone to put Navy up 14-0, a lead that, despite a great game from Army, turned out to be insurmountable. More important, even in an otherwise forgettable year, both teams got to play a game for a national audience. I’m not going to say I watch the service academies week in and week out, but something feels right about capping off college football’s regular season with these two teams bludgeoning each other with option football. It’s what football is supposed to feel like.